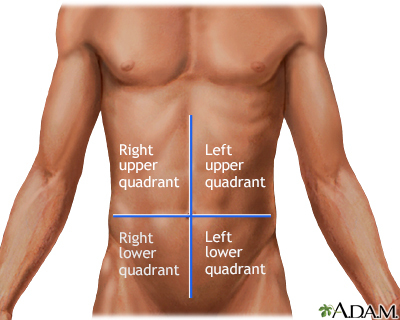 Almost everyone has pain in the abdomen at some point. Most of the time, it is not serious. How bad your pain is does not always reflect the seriousness of the condition causing the pain. For example, you might have very bad abdominal pain if you have gas or stomach cramps due to viral gastroenteritis. However, fatal conditions, such as colon cancer or early appendicitis, may only cause mild pain or no pain. Generalized pain -- This means that you feel it in more than half of your belly. This type of pain is more typical for a stomach virus, indigestion, or gas. If the pain becomes more severe, it may be caused by a blockage of the intestines. Localized pain -- This is pain found in only one area of your belly. It is more likely to be a sign of a problem in an organ, such as the appendix, gallbladder, or stomach. Cramp-like pain -- This type of pain is not serious most of the time. It is likely to be due to gas and bloating, and is often followed by diarrhea. More worrisome signs include pain that occurs more often, lasts more than 24 hours, or occurs with a fever. Colicky pain -- This type of pain comes in waves. It very often starts and ends suddenly, and is often severe. Kidney stones and gallstones are common causes of this type of belly pain. Many different conditions can cause abdominal pain. The key is to know when you need to get medical care right away. Sometimes, you may only need to call a health care provider if your symptoms continue. Sip water or other clear fluids. You may have sports drinks in small amounts. People with diabetes must check their blood sugar often and adjust their medicines as needed. Avoid solid food for the first few hours. If you have been vomiting, wait 6 hours, and then eat small amounts of mild foods such as rice, applesauce, or crackers. Avoid dairy products. If the pain is high up in your abdomen and occurs after meals, antacids may help, especially if you feel heartburn or indigestion. Avoid citrus, high-fat foods, fried or greasy foods, tomato products, caffeine, alcohol, and carbonated beverages. DO NOT take any medicine without talking to your provider. Your provider will perform a physical exam and ask about your symptoms and medical history. Your specific symptoms, the location of pain and when it occurs will help your provider detect the cause. Is it all over or in one spot? Does the pain move into your back, groin, or down your legs? Is the pain severe, sharp, or cramping? Do you have it all the time, or does it come and go? Does the pain wake you up at night? When does the pain occur? For example, after meals or during menstruation? What makes the pain worse? For example, eating, stress, or lying down? What makes the pain better? For example, drinking milk, having a bowel movement, or taking an antacid? MacGilchrist A, Iredale J, Parks R. The gastrointestinal system. In: Douglas G, Nicol F, Robertson C, eds. 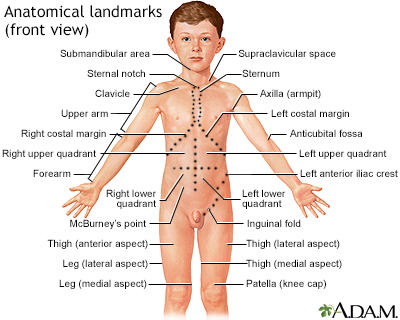 Macleod's Clinical Examination. 13th ed. Philadelphia, PA: Elsevier; 2013:chap 8. 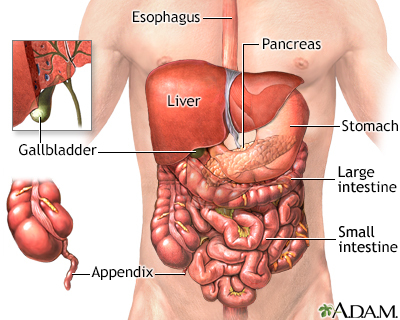 The appendix is a small finger-shaped tube that branches off the first part of the large intestine. 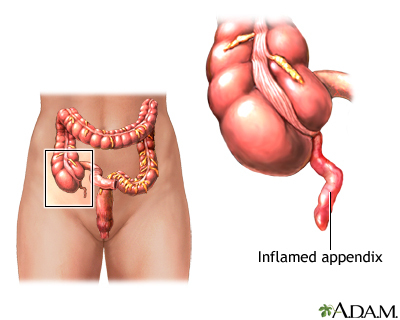 The appendix can become inflamed or infected causing pain in the lower right part of the abdomen. 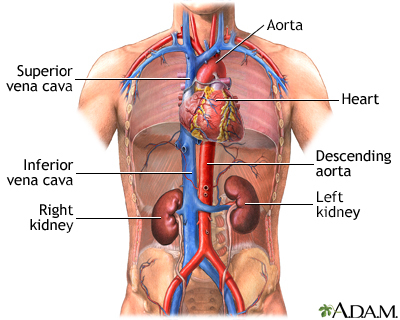 Blood from the aorta reaches the kidneys so it can be filtered and cleaned. Among other functions, the kidneys remove toxins, metabolic waste, and excess ions from the blood which leaves the body in the form of urine.